There has never been a better opportunity than now for business owners to maximize the efficiency and profitability of their employees by using social media tools and internal networks within the workplace. I started using social media networking and tools to improve communication, foster innovation and collaborative thinking in the workplace in 2008. Employee engagement, idea generation and problem solving has never been better – as a result employees fall in line with the vision of the company and profitability and efficiency increases. Problem areas and opportunity are identified more quickly and culture is strengthened. 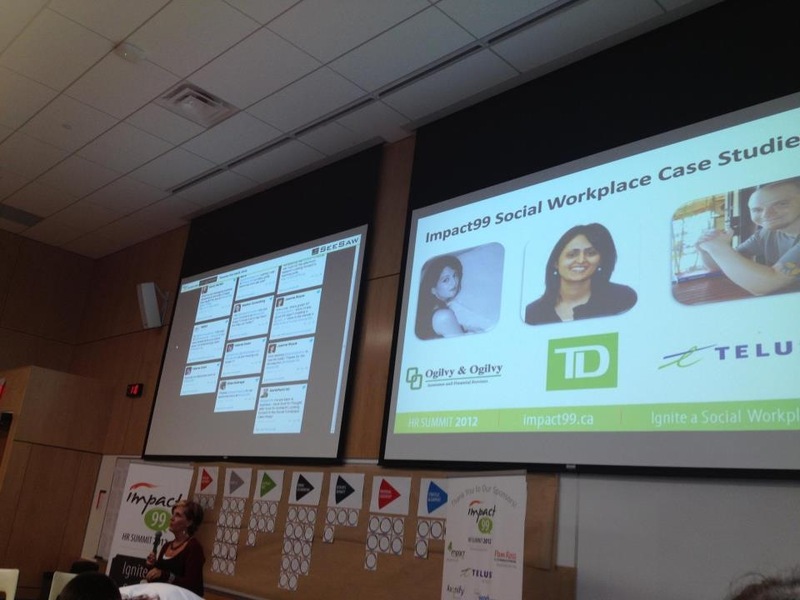 Below is my presentation, with just a few highlights of some of the very interesting features and benefits of using social networks in the workplace from the #Impact99 Social HR conference. Of particular interest is the buy in from all generational groups, as seen in the video – it’s time to dispel the age myth and start producing results with training, patience and innovative approaches to integrating social business into the workplace. From Gen Y to Boomers, social can be successful with the right leadership and approach. Follow my articles with tips and information to help you succeed online and in the workplace. Sign up for my email updates by clicking below – together we can build better workplaces and align company vision with online strategies for success. Subscribe to my Perspectives Blog here!